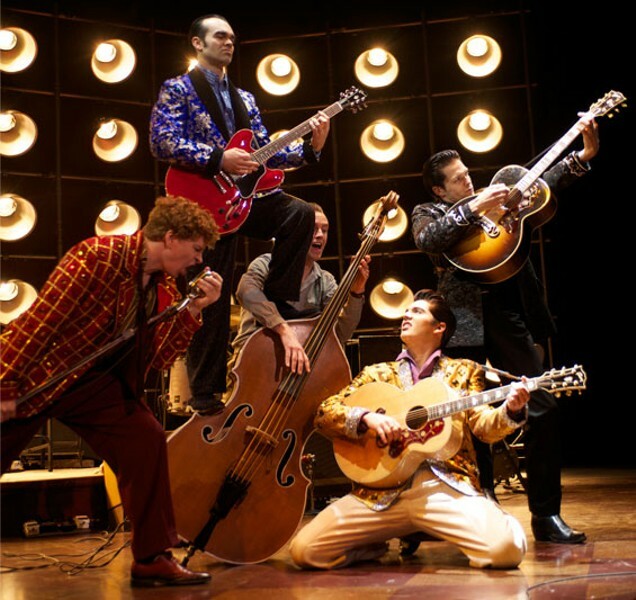 Paul Natkin Million Dollar Quartet is a fine romp through a magical night — when the music's playing, that is. 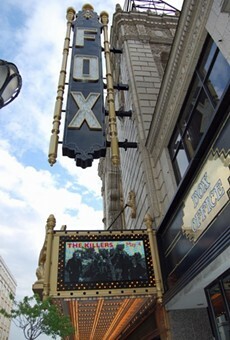 Through May 5 at the Fox Theatre, 527 North Grand Boulevard. Tickets are $15 to $80. Call 314-534-1678 or visit www.fabulousfox.com. Tuesday, December 4, 1956, was a night like any other night — a night of sports and television and music. In a basketball barnburner in Boston, the Celtics edged the St. Louis Hawks 108-107. TV viewers had to choose between the brand-new Jonathan Winters Show (NBC), Phil Silvers as Sgt. Bilko (CBS) and Madison County's own Clint Walker in Cheyenne (ABC). Those who weren't flipping channels on the Philco may have been reading the nation's No. 1 bestseller Peyton Place or listening to the No. 1 Billboard hit, Guy Mitchell's "Singing the Blues." In Memphis that night, four ambitious young recording artists were singing more than the blues. Their repertoire also included country music, rockabilly and gospel. The next day the entertainment editor of the Memphis Press-Scimitar would describe the impromptu jam session by Johnny Cash, Jerry Lee Lewis, Carl Perkins and (already the best-known of the bunch) Elvis Presley at Memphis' modest Sun Studios as the meeting of "the million dollar quartet." (In 1956 a million dollars still sounded like a lot of money.) Million Dollar Quartet, the high-octane musical that is currently hurling great balls of fire throughout the Fox Theatre, does not attempt to accurately chronicle what happened on that Tuesday night in Memphis; rather, the show's ambition is to re-mythologize an already mythical event. What really happened is that four once-poor-as-dirt Southern boys from rural Arkansas, Louisiana, Mississippi and Tennessee came together to let down their hair and return to their country-music roots; they sang music by Bill Monroe, Hank Snow, Ernest Tubb. But Monroe, Snow and Tubb aren't going to sell tickets on Broadway. Instead we are treated to songs that we might wish the four icons-to-be had sung. Whenever the Fox Theatre air is filled with music, anyone with fond memories of the old Sun Records sound is gonna be in hog heaven. It's when the singing stops that Million Dollar Quartet isn't worth a plug nickel. That's when Sam Phillips takes charge. Phillips, who founded Sun Records in 1950, is our self-serving narrator, and a less appealing protagonist would be hard to imagine. When he's onstage, Elvis, Carl, Jerry Lee and Johnny are mere supporting players in The Sam Phillips Show. Carl or Elvis will sing a song, the audience will applaud appreciatively, then Phillips will emerge to say, "How about that boy on the guitar," and everyone has to applaud again. Quartet could trim three or four precious minutes simply by eliminating Phillips' fawning gratuities. There are also lots of manufactured crises, mostly involving Phillips, that did not happen that night. But myth is a license to let the imagination stray. When they're singing together, the four performers blend beautifully. But as written by MDQ co-authors Colin Escott and Floyd Mutrux, they're an odd lot. Carl Perkins (James Barry), who wrote "Blue Suede Shoes," enjoyed the least success of the four (until he was lionized by the Beatles). So it's hard to know how close Barry is to the real Perkins. David Elkins brings a gentle stillness to Johnny Cash, and Cody Slaughter cuts past the iconic Presley legend to reveal a sweet kid. Ben Goddard plays Jerry Lee Lewis like Harpo Marx with a big mouth. Legend has it that Elvis was the first of the four to leave that night because he was intimidated by Jerry Lee's talent. But as Lewis is obnoxiously portrayed in this script, it's surprising that anyone hung around to jam with him at all. The evening starts loud, then gets louder. (It is rock & roll, after all.) But MDQ works best when it's least glitzy, when the script gets out of the way and four simple souls harmonize on gospel music like "Peace in the Valley." It's during those few pristine moments that we sense the spiritual importance of music in their lives and in our own.